With the holiday season fast approaching, it’s the perfect time to gear up your eCommerce business. Even if 2014 wasn’t a great year for you, fear not! You’re never too late to learn from your previous experiences and end 2015 with a bang. According to ComScore, in 2014 Thanksgiving and Black Friday saw a growth of 32% and 26% in online sales, respectively. Last year, Cyber Monday reported the top US spending day with $2.04 billion. So, make the most of 2015’s holiday season to grab your customer’s attention to your store and give them more than just a shopping experience. 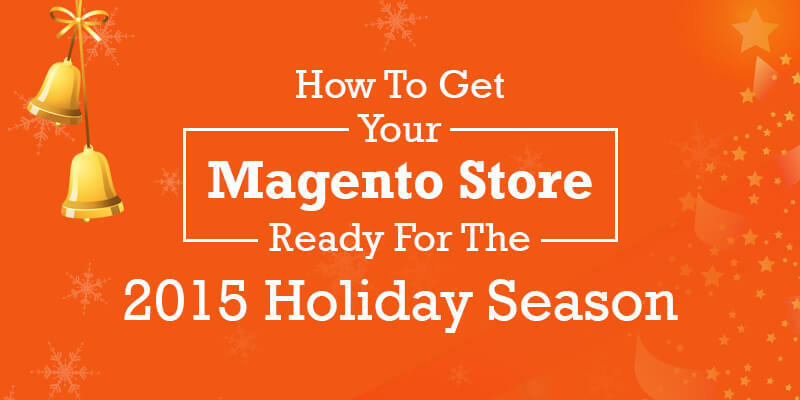 We got with our Magento developers and came up with the most important elements your Magento eCommerce store needs to focus on for the 2015 holiday season. When customers think of the holidays, they usually associate the season with Christmas time. Thus, it’s important to set the right mood of the season for your customers so that they’d want to explore more just by looking at your site. Ensure the images and videos are of high resolution and that they reflect the, “holiday tone.” Thanks to Magento’s powerful customizable themes and visual aids, you can quickly get your store revamped just the way you want. The most important factor to ensure a smooth sale is to understand the capacity of your server. Getting a lot of traffic to your site has hidden dangers – Server Crash! You need to evenly distribute the traffic across multiple web servers with the help of load balancers. Take a minute to study the previous year’s traffic rate and then consider having a backup of your server resources. It’s important you get a reliable, agile hosting provider and not go for cheap hosting services. We love Rackspace, Magento’s major hosting partner – Using them we can guarantee you’re in safe hands. According to KissMetrics, 47% of visitors expect a page to load in 2 seconds, and 79% of shoppers will not return to a website if they were dissatisfied with its performance. Worst case is that 44% of them will also talk about your site negatively to their friends. There’s only one thing you can do about this: TEST! Implement regression testing by incorporating all the scenarios your holiday customer could encounter on your Magento store. Figuring out the parameters to test and approaching the testing methodically ensures successful load testing. Don’t cut corners here. Users may browse different products in various categories. When the pages on your site are slow, it will frustrate them and you could lose customers to your competitors. It’s estimated that a day’s low performance can cause 7% decrease in conversion rates. One of the best ways to improve your site’s speed is by setting up CDN (Content Delivery Network) using relevant Magento plug-ins. CDN is a network of geographically dispersed servers. Basically, when a user requests your site, the CDN node closest in proximity to the user will deliver the static content, thus consuming less time. It also prevents your site from crashing in the event of traffic surges. Going out of stock during holiday season is quite common. Studying the previous year’s stock report is an easy way to predict how much you need to be prepared. It’s important to constantly monitor your stock extensions before it becomes too late. It’s better to leverage your store’s policies at this season, where buyers can find a lot of alternatives. With regards to returns and exchange policies, you can go an extra mile in order to retain your loyal customers. You could extend the exchange dates or make more exciting offers to please your customers. Effective shipping management also plays an important role during holiday season. According to ComScore, nearly 60% shoppers were willing to add more products to their cart to qualify for free shipping. Over 80% were willing to wait an additional two days for delivery if shipping is free. 50% of online traffic during the holiday season in 2014 was from mobile. Your Magento eCommerce store has to be mobile friendly to ensure you don’t lose customers. Test your mobility extensions and make sure your Magento mobile tools are scalable, fast, secure and up to date. Make sure offline features, store locators, order tracking, etc. work well on mobile and test for their unified experience across all platforms. Having a detailed SEO strategy during holiday season can be quite helpful to increase holiday traffic to your site. Among all the traffic sources, organic search tops with 51% of traffic while paid search drove 17.5% in conversions. Ensure your site’s URLs are crawled successfully and you don’t miss out on the popular keywords. Optimizing your site’s performance and speed can also amount to a better ranking in Google. Never compromise on SEO tactics, especially during the holiday season. Having to fill long forms and a series of questions at the time of check out can irate your customers. An average of 69% cart abandonment can be avoided during this holiday season by implementing a smooth, secure checkout process. You can also allow guest checkout facilities where only limited information is required and the buyer can choose from multiple payment options. Discount codes are a key driver during holiday season. Who wouldn’t love to have an extra benefit on a holiday season? Your holiday campaigns can mess up big time if your discount codes are not configured properly. Ensure you test your discount codes before you launch them. Consider offering gift cards and coupons and special incentives. This is a way to increase your regular customers. Analyzing what brought consumers to your site and a glimpse on past campaigns is important. The most effective marketing strategy during holidays is email. According to recent research from Yesmail, during the 2013 and 2014 holiday seasons, more consumers opened emails sent by businesses. Don’t forget your loyal customers. Set up a dedicated blog on your Magento site and ensure your site’s upcoming products are featured. Also, you can make your products shareable on social media and make your holiday season, a perfect experience! Following these steps will create for your customers a memorable, hassle free holiday shopping experience. Need some last minute eCommerce development? Contact us today.